Huawei is set to announce a wave of new smartphones at CES 2013 next week and we're seeing more leaks surrounding its probable new handsets. This time round we've got another glimpse of the Huawei W1, Ascend D2 and Ascend Mate, all of which see the Chinese firm go a bit more up market than its current array of mid- and low-end phones. First up is the long awaited Windows Phone 8 device from Huawei, which is currently being referred to as the Ascend W1. The handset is expected to feature a 1.2GHz dual-core processor, 4-inch display and 2,000mAh battery which will see it rival the HTC 8S and Nokia Lumia 820. In keeping with the colourful tradition of Windows Phone the latest image leak shows the Ascend W1 in four hues; white, black, blue and pink. Next up is the hotly rumoured monster handset known as the Huawei Ascend Mate which will, according to reports, sport a ginormous 6-inch 720p display giving the Samsung Galaxy Note 2 a run for its super-sized money. The same phone was also seen being displayed in a shop in China by a Huawei bigwig, so it seems nailed on this is happening. Other rumours suggest the Android-toting Ascend Mate will pack in a beefy 1.8GHz dual-core processor, 2GB of RAM and a huge 3,800mAh battery into a body 9.9mm thin. Lastly is the Huawei Ascend D2 which itself packs a big 5-inch full HD display, putting it in direct competition with the much rumoured Sony Xperia Z, and from the latest press shot leak it sports a design which reminds us of the popular Samsung Galaxy S2. 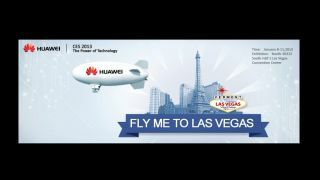 Hopefully all will be revealed next week at CES 2013 and TechRadar will be in attendance at the Huawei press conference to bring you all the latest news as it happens.